or maybe you’re thinking I’ve completely lost it. For those of you who will click away because you don’t have time to read a crazy woman’s blog, see ya later. Here’s a little glimpse into the crazy that is me. My kids go to a non-denominational Christian school. When they were little, every few years, one of them would come home from school in October and tell me that one of their teachers had told their class that celebrating Halloween was a sin. They came home with horrible stories about pagan practices and a load of guilt bigger than their backpacks. I always responded the same way. If you came away from that story with “Salvation is like getting candy.” then I am a terrible writer and you should just CLICK HERE and go waste your time somewhere else. Here’s my point: Our family’s approach to and motivation for celebrating Halloween has nothing to do with the horrible things associated with Halloween and everything to do with what we love about Halloween. Are there horrible things associated with Halloween? We don’t celebrate Halloween because of those things. 1. The spreading of the Christian gospel by preaching or personal witness. My approach to and motivation for sharing how my life is impacted by my faith in Christ has nothing to do with “militant or crusading zeal” and everything to do with the fact that my relationship with Christ is the best part of my life. Some people, who know about the “militant and crusading zeal” definition (maybe because they’ve been a victim of it in the past? ), will be hard pressed to hear any talk of Christ through any other filter. They would rather I shut the hell up. And be gone. But here’s the thing. I don’t often talk about hell. Not because hell doesn’t exist. I believe it exists just like I believe pagan Halloween practices exist. And I’m not afraid of talking about hell. It’s just that hell is not at the forefront of my mind or my motivation when I talk about what Christ is doing in my life. Rather, my passion for Christ stems overwhelmingly from the foundational peace and joy I experience because I am saturated by the intimacy of my relationship with Him. So, to review. How is evangelism like Halloween? Halloween: Our family’s approach to and motivation for celebrating Halloween has nothing to do with the horrible things associated with Halloween and everything to do with what we love about Halloween. Evangelism: My approach to and motivation for sharing how my life is impacted by my faith in Christ has nothing to do with “militant or crusading zeal” and everything to do with the fact that my relationship with Christ is the best part of my life. Is Halloween about pagan practices for you? Does evangelism mean "militant and crusading zeal" to you? I am sorry for your loss. and more candy for me. Tangent: Notice something. NOWHERE in the original definition #1 or in my filtered definition #1 is there ANY mention of converting people. Maybe for some. 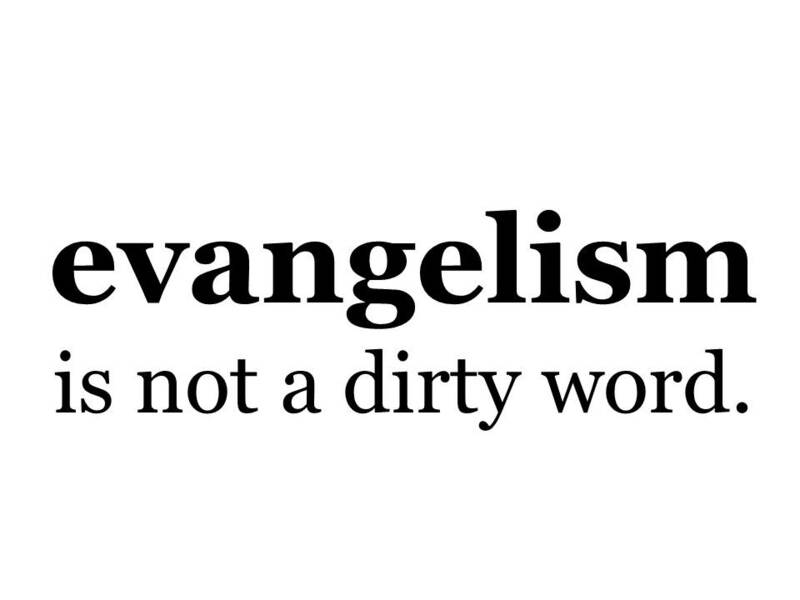 But they hold to a different definition of the word evangelism. Conversion is not my goal. Please don’t put words in my mouth or ulterior motives up my sleeve. How am I so sure I don’t harbor a hidden goal to “convert” someone? Two reasons: (1) I am abso-flippin-lutly confident that I can’t convert anyone. Only God can do that. (2) I love being a stepping stone in someone’s growth. It’s my favorite part about training and coaching. I love asking people questions and I love learning what makes them tick. The side benefit is that I usually learn something in that process. Danger Will Robinson. Rant Ahead. Here’s the thing. I understand that there are people who have been a victim of “militant and crusading zeal.” I’ve been a victim of militant and crusading zeal. But I saw the zealots for who they were. A misguided fragment. I did NOT automatically stuff all Christians who talk about their faith in a tiny little box and write them off as annoying wackadoodles to be ignored or venomously and sarcastically ridiculed. I personally believe that most reasonable, tolerant people are intellectually capable of evaluating individuals and situations on their own merit. Evangelism means different things to different people. I’ve explained why I tell people about my faith, but I haven’t explained how evangelism fits into my everyday life. Yep. That’s bound to get me in trouble with somebody. I can feel it already. “Bloggin blind” is liberating. This is the 12th post of a series. CLICK HERE to view a page listing all the posts in the series. ← I made a mistake.